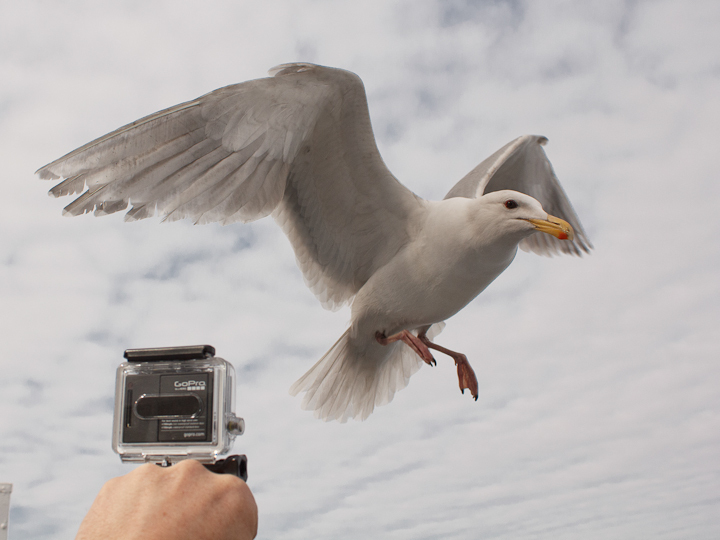 I have written about gulls before, and exploiting their love of potato-based baits to get close up photos, and I have written about using a GoPro. This time, I combine the two, for a 120 fps free-for all, slowed down to 1/4 speed for your edification. Along the way, I also managed to snap a few other cool shots. 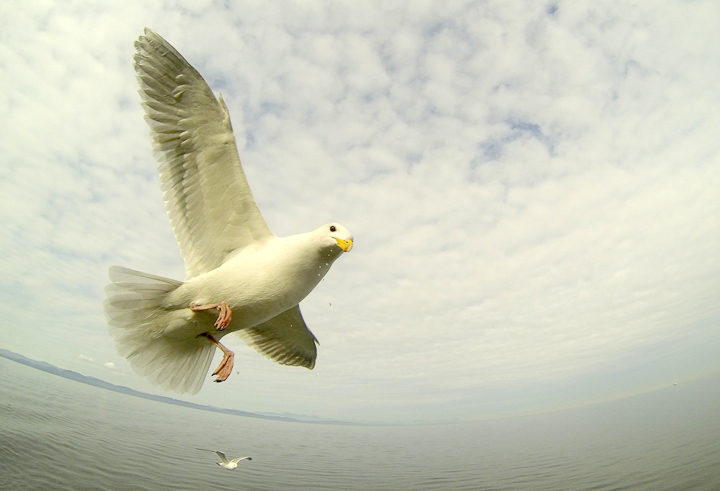 This is a still from the GoPro. Note the extreme distortion and the off yellowish cast. 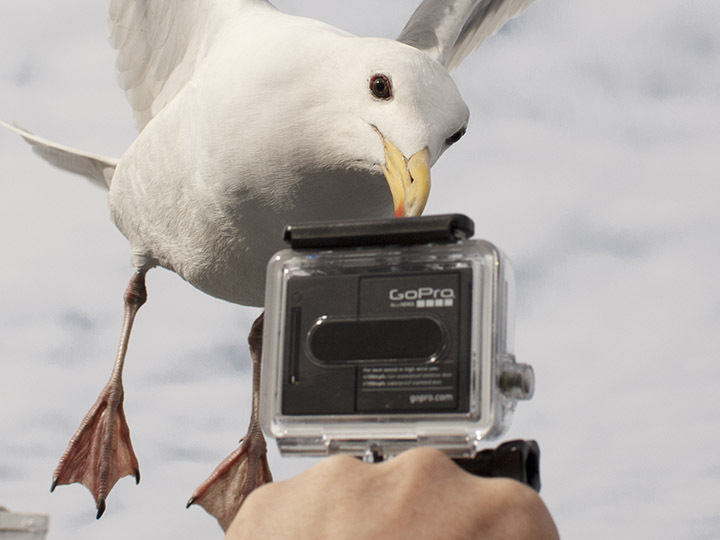 And here is a shot from my Canon 60D. 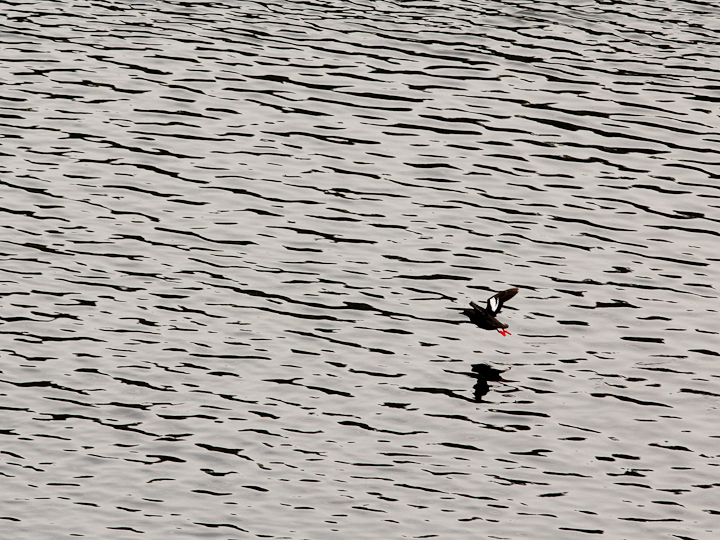 A Pigeon Guillemot on a oddly pleasing background. 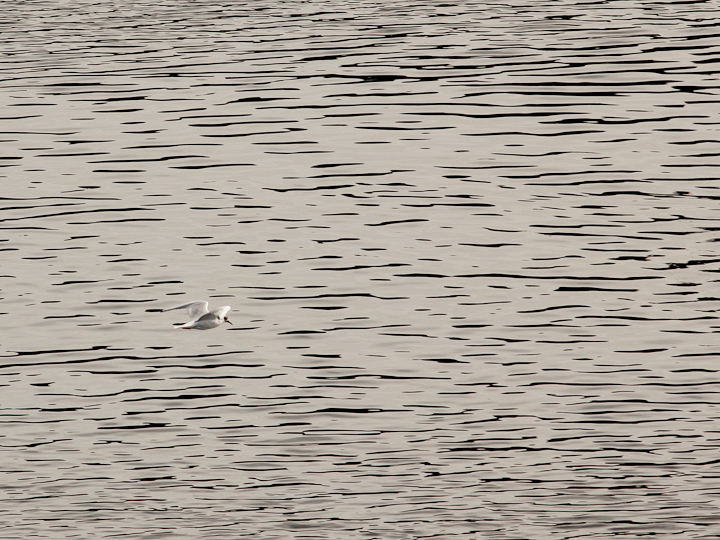 When the sea looks like this, it is almost like a woodcut. 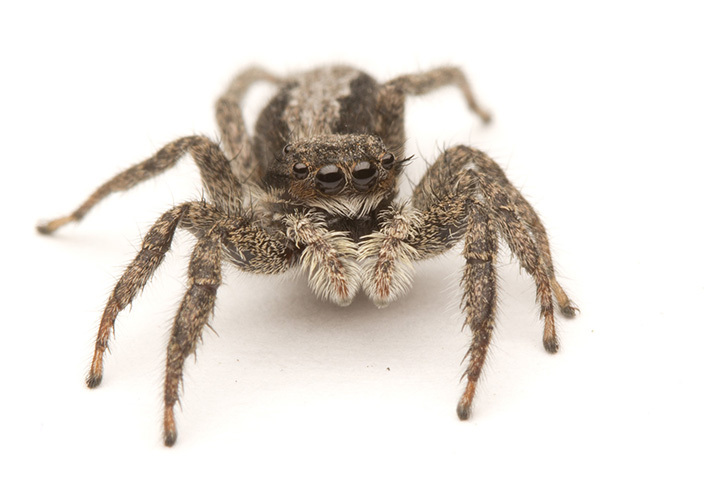 Look at this beautiful Platycryptus californicus jumping spider!! She is so nice and plump! She was not always this way. When my labmate Nathan found her she was emaciated and dirty and living on the lab wall. So we fed her some blowflies! Notice her shrunken abdomen. She is holding her legs clear of her prey while it succumbs to the venom. Because we have fed her so well, she is now a much more attractive beast. Anyway, today we started using a really nice high speed camera (for secret science stuff), and I needed to get the hang of working with this beastly machine. 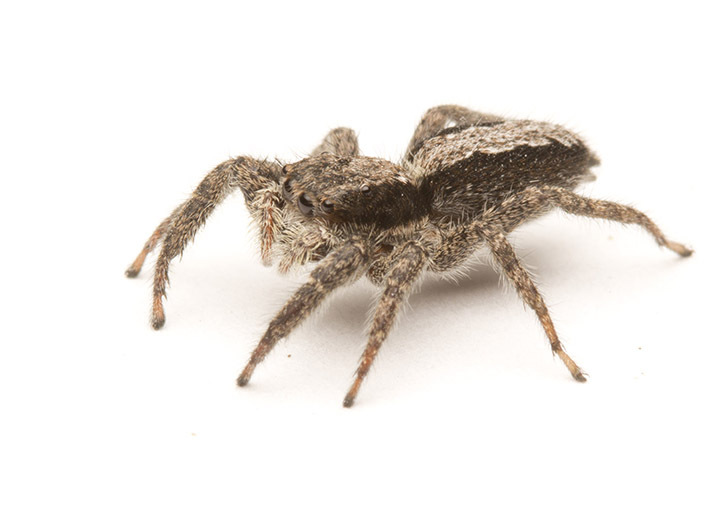 I decided a good subject would be this jumper jumping on a calliphorid fly. The videos are below. Please start the video and then immediately click the HD option and view fullscreen, as the default is kind of ugly. So these videos are not the best in the world, as there is an annoying slowed down flickering from the incandescent light we were using (60 Hz! ), but they are pretty cool anyhow. Hopefully I will do better when we get a better light source! BTW, in both of these instances, the fly escaped. 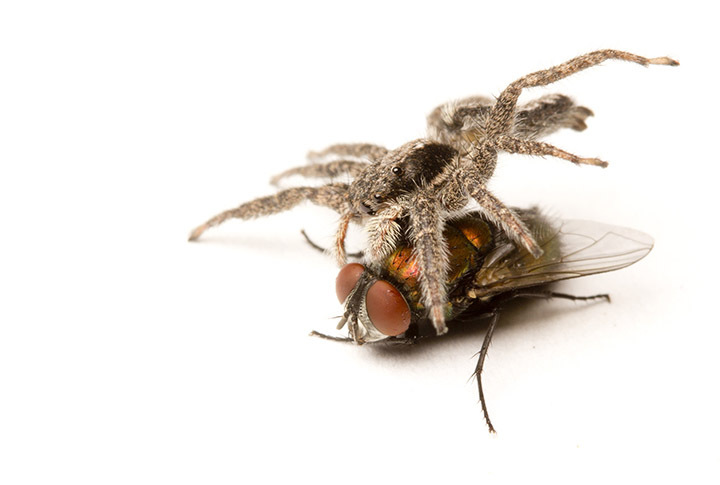 I am not even sure if the spider wanted to catch the fly, as she was already a bit stuffed. I will have to try this again with a hungrier jumper.